UConn and Notre Dame have been on a collision course all season for what would be an unprecedented national championship game. Now the two unbeaten teams are each one victory away from a showdown in Music City. Standing in the way of that historic matchup are Maryland and Stanford. 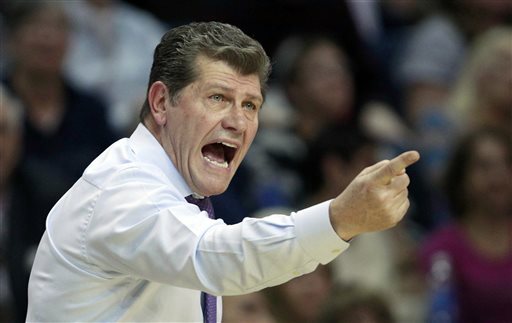 “If they just wanted a Connecticut-Notre Dame showdown, what’d they make us do this for?” Stanford coach Tara VanDerveer quipped. The Cardinal will face the top-seeded Huskies while the Irish will play the Terrapins on Sunday in the Final Four in Nashville, Tenn. Both games are rematches from earlier in the season. Connecticut, which has won 44 straight games, advanced to the national semifinals for the seventh straight season. The Huskies won the national championship last year and are trying to win a record ninth title after beating Texas A&M in the regional finals. Like the Huskies, the Irish have been to four straight Final Fours. They are the sixth school to reach the national semifinals in four consecutive years, joining UConn, LSU, Stanford, Louisiana Tech and Tennessee. The Irish’s chances of winning their first national championship since 2001 took a big blow when forward Natalie Achonwa tore the anterior cruciate ligament in her left knee in the regional final victory over Baylor. Achonwa was third on the team at 14.9 points per game, but the Irish will miss her most on the boards since she led the Irish in rebounding with 7.7 per game. The Terps advanced to their first Final Four since winning the national championship in 2006. Frese doesn’t mind that all the talk seems to be about the two unbeaten teams. Maryland will have a chance to avenge an 87-83 loss to Notre Dame in late January. Both Stanford and Notre Dame advanced winning regional finals at home, while Maryland had to go into Louisville before 14,002 to move on. Reaching the Final Four was about the only thing missing from Thomas’ stellar career. 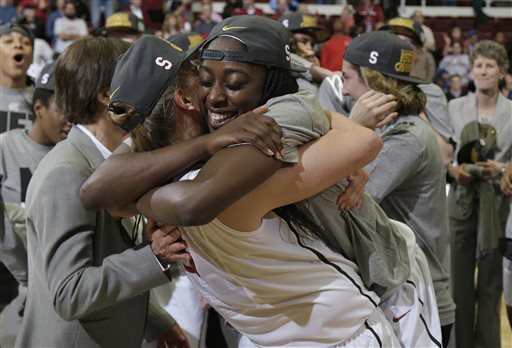 While it’s her first trip to the big stage, fellow All-American Chiney Ogwumike has the Cardinal back in the national semifinals for the sixth time in seven years after beating North Carolina 74-65. Stanford was eliminated in the regional semifinals by Georgia last season, ending a streak of five straight trips to the Final Four. Now Ogwumike has the Cardinal back in the national semifinals and trying to win their first championship since 1992. The Cardinal have had their chances, losing to Tennessee in the 2008 championship game and to Connecticut for the 2010 title. Stanford also lost to UConn in the 2009 national semifinals, to Texas A&M in the 2011 semis and Baylor in the same round the following year.